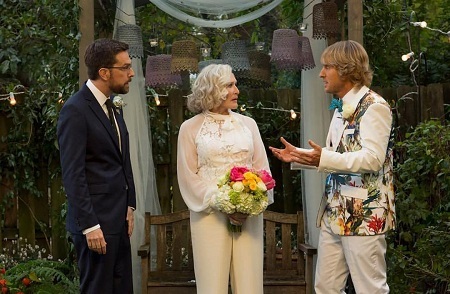 After estranged fraternal twin brothers Peter (Ed Helms) and Kyle (Owen Wilson) learn from their mother Helen (Glenn Close) that’s she unsure who their biological father is, the pair head out an a road trip to try and find him. 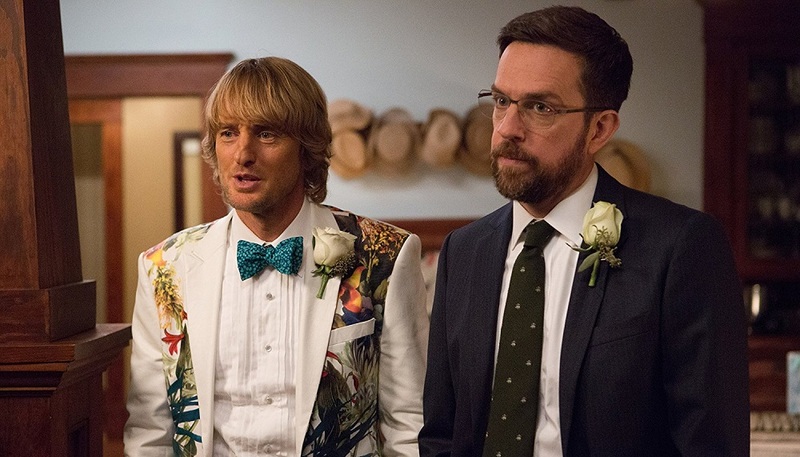 “At the wedding of their mother Helen (Close) to kindly gentleman Gene (Harry Shearer), fraternal twin brothers Peter (Helms), a surgeon who focuses on colon cancer, and Kyle (Wilson), a easygoing slacker who lives in Hawaii with his pregnant girlfriend Kaylani (Jessica Gomes), inadvertently discover they’ve been told a lie their entire lives. Turns out, their dad didn’t die of cancer before they were born. Even worse, as far as Helen knows the man still might be alive. Truth of the matter is that she isn’t exactly sure who their father is, and the only thing she’ll tell them about her past is that she was dating none other than Pittsburgh Steelers great Terry Bradshaw around the time the pair were conceived. With his life in a rut, Peter is determined to head to Florida, track down Bradshaw and learn whether or not the Hall of Fame football player is in fact his dad. Eager to support his brother, Kyle decides to join him, the two hitting the road eager to learn the truth. But things take one incredible turn after another, and soon the pair are traversing the country tracking down a variety of likely suspects including a former investment banker (J.K. Simmons), a retired undercover police detective (Jack Mcgee) a kindly small town veterinarian (Christopher Walken) all of whom might be their long-lost father. Along the way Peter and Kyle will discover why they’ve grown apart over the years as well as encounter a number of intriguing potential new friends, including an oddly depressed woman drinking away her sorrows in a bar (Katie Aselton) and a perceptively inquisitive hitchhiker (Katt Williams) claiming to be trying to get home to his wife and children, learning answers to a number of universal questions while out on the road. 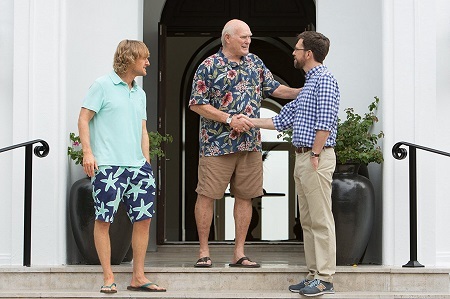 Father Figures is an oddly ambitious road trip comedy. While the trailers have gone out of their way to make this movie look like a cheap gross-out comedy of errors, missed opportunity and mistaken identity, this actually ends up being something an intriguingly self-reflective story of family, brotherhood and regret that’s kind of fascinating. There are a number of good ideas hiding inside Justin Malen’s (Office Christmas Party) screenplay, The Hangover cinematographer turned director Lawrence Sher handling things with a level of honest emotional directness that’s hugely surprising. If only all of that would have actually made the movie good. Sadly, as hard as everyone involved tries, as solid as the efforts of the cast and crew might be, this overlong dramatic comedy is frustrating in the extreme, making sitting through things all the way to the end annoying difficult. Malen’s script undercuts almost all of its best ideas with moments of cheerless cruelty and half-baked melodramatic schmaltz that grows increasingly tiresome as things progress. For every good scene there’s a subsequent three or four that follow it that are almost impossible to watch without squirming, the entire subplot featuring Williams, who is admittedly terrific, so off-putting and racially insensitive one would almost think the moment was taking place in 1967 and not 2017. But the real problem is that, other than a few random moments here and there, this comedy just isn’t funny. While Helms and Wilson make an engaging twosome (even if they’re not exactly believable as twins, even fraternal ones), and even though Close has one killer scene near the end where the truth is revealed. There’s so much dead air here it doesn’t matter that Malen and Sher are reaching for more than the basic synopsis hints at or that they’ve populated their films with a number of incredible character actors and intriguing personalities. Things just don’t hold together, the slapdash quality to each of the vignettes Peter and Kyle find themselves involved with oftentimes feeling completely disassociated from any of the ones that preceded it. The subplot concerning Simmons is particularly loathsome, the great June Squibb left completely out to dry portraying a character who’s frustratingly never allowed to make the sort of mark I kept hoping she would. Nope. Still doesn’t work for me. I wanted to give Father Figures a second chance mainly because, even if I didn’t particularly like the movie during my first viewing, I still respected its ambition quite a lot. But the comedy just doesn’t work, undercutting itself and demolishing its potential to entertain at seemingly every turn. What a waste. 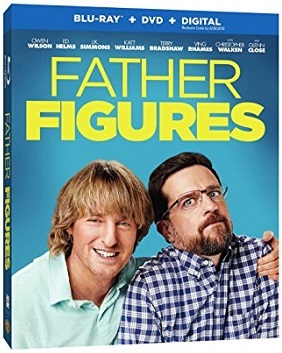 Father Figures is presented on a 50GB Blu-ray MPEG-4 AVC Video with a 2.39:1 1080p transfer. This Blu-ray features an English DTS-HD Master Audio 5.1 soundtrack along with French, Spanish and English Dolby Digital 5.1 tracks and includes optional French, Spanish and English SDH subtitles. The only extras here are a handful of Deleted Scenes and a Hilarious Gag Reel. Seriously. They use the word “hilarious.” I’m not kidding. The ambition driving Father Figures keeps making me want to give it the benefit of the doubt, tries to convince I’m going to find something worthwhile lurking inside this comedy that makes me rethink my original opinion. While that has not proven to be the case, Warner’s Blu-ray release is still a strong one, and it’s likely fans will be more than satisfied if they pick the disc up for the collection.